Great hotel in a stunning setting in the mountains. Well worth the effort to travel to and the location is breath taking. Lots to do, horse riding, hiking or biking. Lake with canoes and paddle boarding. Where to find Gold Bridge hotels near an airport? Where can I find hotels in Gold Bridge that are near tourist attractions? Those who'd like visit Gold Bridge should think about booking a place to stay well in advance of their departure date, as there isn't an extensive range of lodgings near Gold Bridge's downtown. However, Vancouver has a number of accommodation options. It is 180 kilometres (113 miles) from Gold Bridge. Expedia listed accommodation options in Vancouver include the Fairmont Pacific Rim and Shangri-La Hotel, Vancouver. 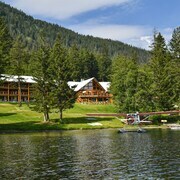 The Tyax Wilderness Resort & Spa is 6 kilometres (4 miles) distance from the center of Gold Bridge. Looking to venture a bit further afield? Vancouver Coast offers many attractions. Check out Vancouver Coast's old towns, fortresses and art museums. Those with a hankering for wide open spaces and fresh air can also take the time to to enjoy the region's forests, rivers, streams and lakes. In this part of Canada tourists may try their hand at snowboarding, skiing and cross-country skiing. Looking for things to do? Consider spending a few hours exploring The Range and Coast Range Heliskiing, which you'll find in Whistler Village, 90 kilometres (55 miles) to the south of Gold Bridge. If you'd like to visit Whistler Village, check out the Whistler Luxury Condos and Powder's Edge by Whiski Jack. 65 kilometres (40 miles) to the east of Gold Bridge, you'll find Lillooet, home to the Hotel DeOro and Canadas Best Value Inn-Mile 0. The Fort Berens Estate Winery and Lillooet Museum and Visitor Centre are a couple of the popular places to experience in Lillooet. Before your Gold Bridge trip comes to an end, why not spend an hour or two hanging out with Vancouver Coast sports obsessives at a local game. Whistler Sliding Centre is 90 kilometres (55 miles) to the south of Gold Bridge. Book a hotel close to the action at the Embarc Whistler or the Tyndall Stone Lodge by Whiski Jack. Our travel listing is also a very good way to learn more about Gold Bridge. Are there hotels in other cities near Gold Bridge? Explore Gold Bridge with Expedia.ca’s Travel Guides to find the best flights, cars, holiday packages and more! Flights from Calgary Intl. to Murtala Muhammed Intl. Flights from Calgary Intl. to Malpensa Intl.